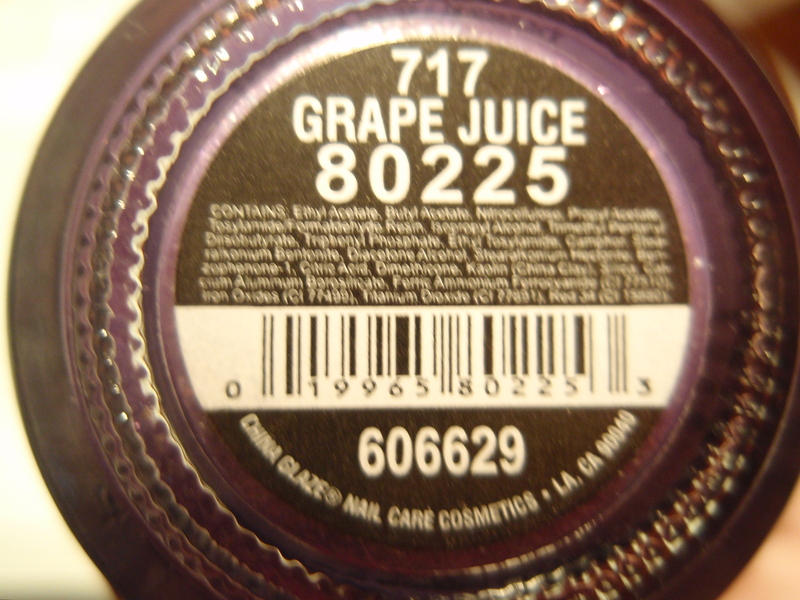 “Grape Juice” is a purple, glitter polish. I KNOW. GLITTER. Which means it’s not the most fun thing to remove from your nail. But I don’t really mind that much. So yeah. 😀 It’s glitter, but even without a top coat, the polish, when dried, feels smooth on the nail. It’s so pretty. 🙂 The color kind of grew on me. At first, I thought it was just nice. I wasn’t CRAZY about it, but it’s not like I disliked it. But the longer I wear it, the more I like “Grape Juice.” It’s a nice purple that gets darker the more coats you layer on. I took a picture of a close up of the bottle so you can see the sparkles. You can see the tiny silver flecks of glitter. The camera managed to capture the color very well for all the photos! The color of the polish in the photo is spot on to the color in real life. I like this color a lot, and I recommend it to any one. It’s not thick and chunky and it’s somewhat subtle. But it still draws attention. Good attention! Sorry to get off topic, but do I seem less enthusiastic than usual? I’m just tired from school. I keep going to sleep late and waking up early. Oh well. I still had a good day, and I hope you did too! And I hope you enjoy the quick, simple review! Feel free to click on any of the photos to see larger, more-detailed versions of them. P.S. I have had “Heart of Gold” by Neil Young stuck in my head all day. It’s time for another one of my random reviews. 😀 And it’s a review on a nail polish by my favorite brand. 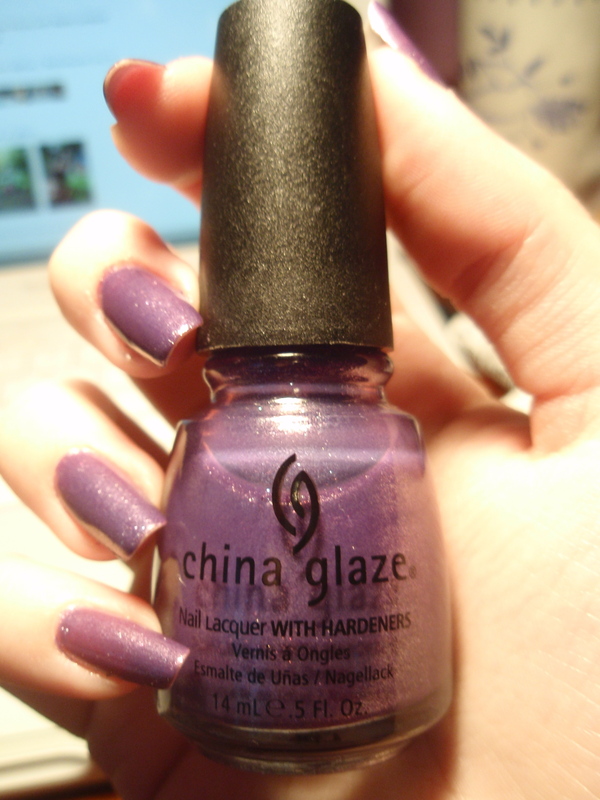 CHINA GLAZE! So, let’s just dive into it. 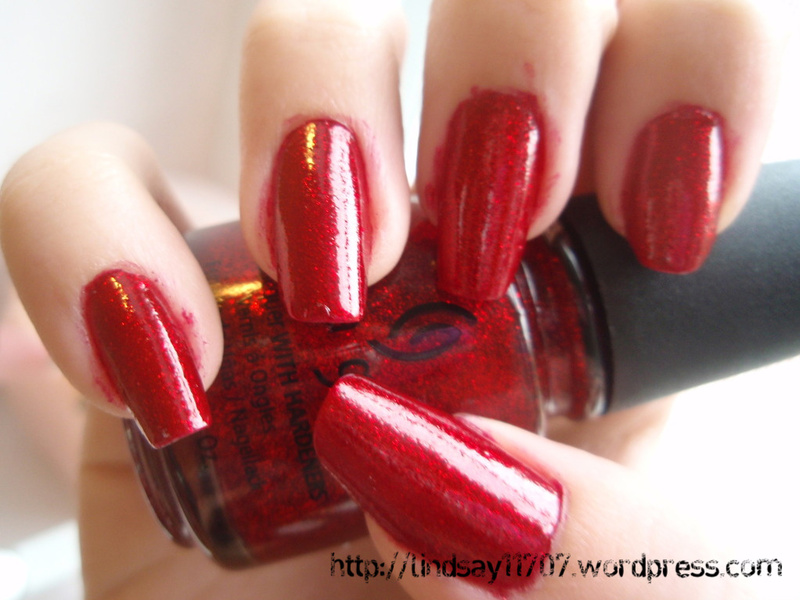 Ruby Pumps is a bright, red glitter nail polish. 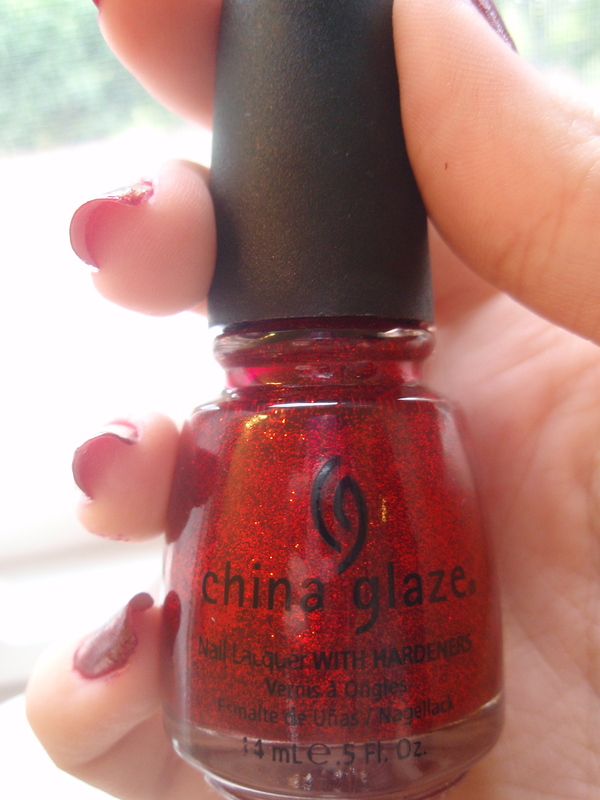 It’s very “Valentine’s Day.” It reminds me of a glitterfied version of China Glaze’s Sacred Heart (Neon). This polish is so much fun to use! It dries really fast and goes on nice and smooth, despite the glitter! I love smooth polishes. Just applying the polish is fun. I can’t describe what it is like to apply “Ruby Pumps”, so you have to get it for yourself and find out the fun that you are missing. It’s… so… glittery. It SPARKLES in the light! 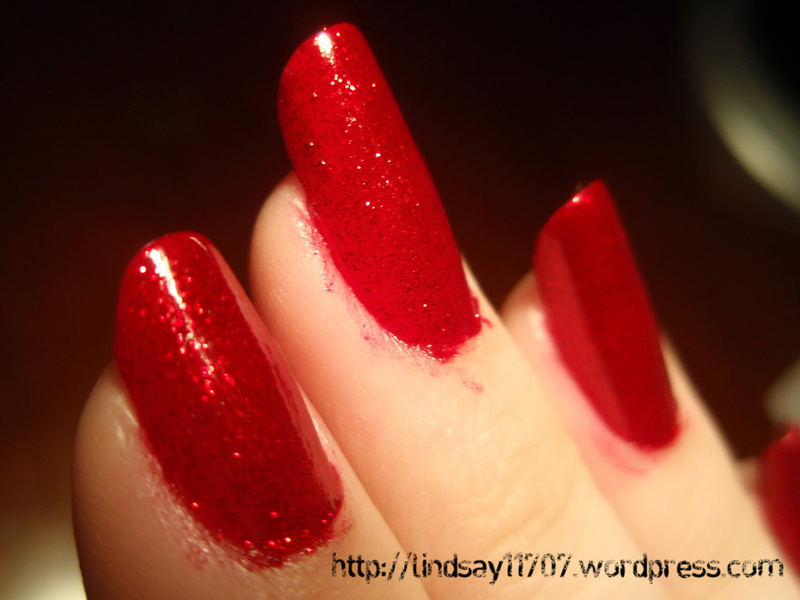 It’s fun to look at your nails when wearing “Ruby Pumps”. I could look at my nails all day. Is that vain? Who knows. This is a picture taken by my window, using sunlight, to show off the sparkles. The color in this photo is pretty spot on! Which seems to rarely happen whenever I take pictures. I guess the natural lighting is better than the light from the lamp on my desk that I usually use. But the problem here is that I usually take all the photos at night. And the sun USUALLY isn’t around at night. Lol. This photo was taken using the light from my desk lamp. As you can see, the color is a little bit different from the photo above. I like the first photo better, but I decided to put this up to show the comparisons. Oh! Please pardon the fact that there’s extraneous nail polish on the sides of my nails. I’m a messy (sorta) painter when it comes to simply putting on a base color. It saves me time to just quickly put on the base color, rather than apply it carefully. Lol. Once the polish dries, I always just peel off the extra polish. It’s just my way of doing nails. Not very professional, but oh well. 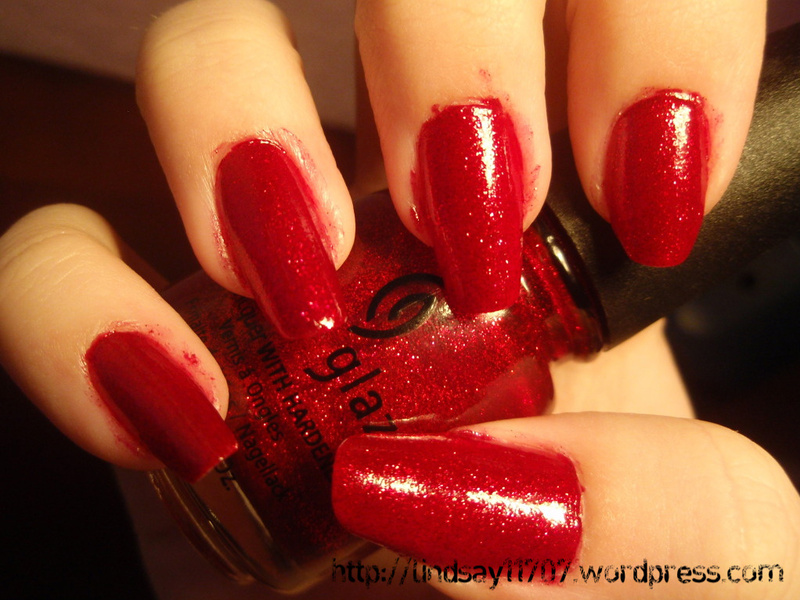 I wanted everyone to see how glittery this polish really is, so I took a couple of up close pictures to show you! And you can click on the photos to enlarge them, and see greater detail! So. 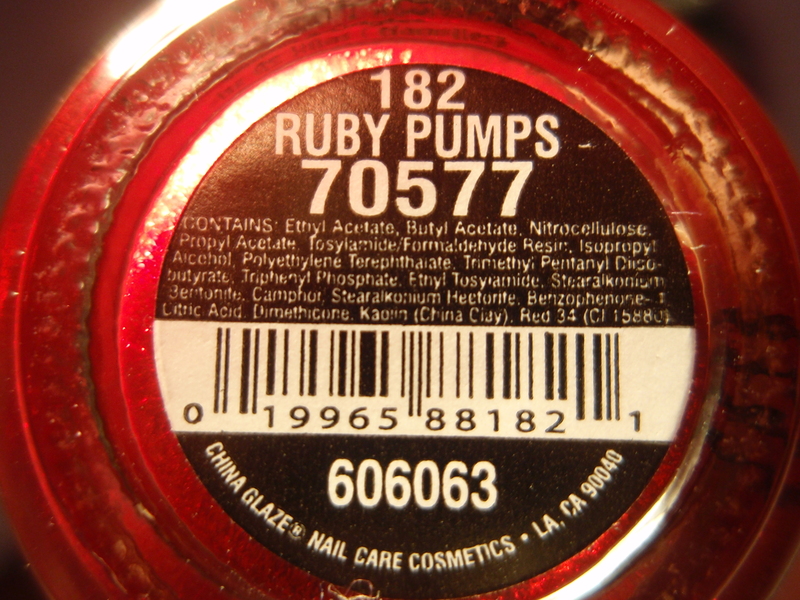 I had a lot of fun with “Ruby Pumps.” And I don’t see how anyone could not. I really can’t think of one bad quality about this color. Goes on smoothly, dries quickly, looks GORGEOUS. There’s nothing not to love. 🙂 I think that wraps up the review. Well. Great news. 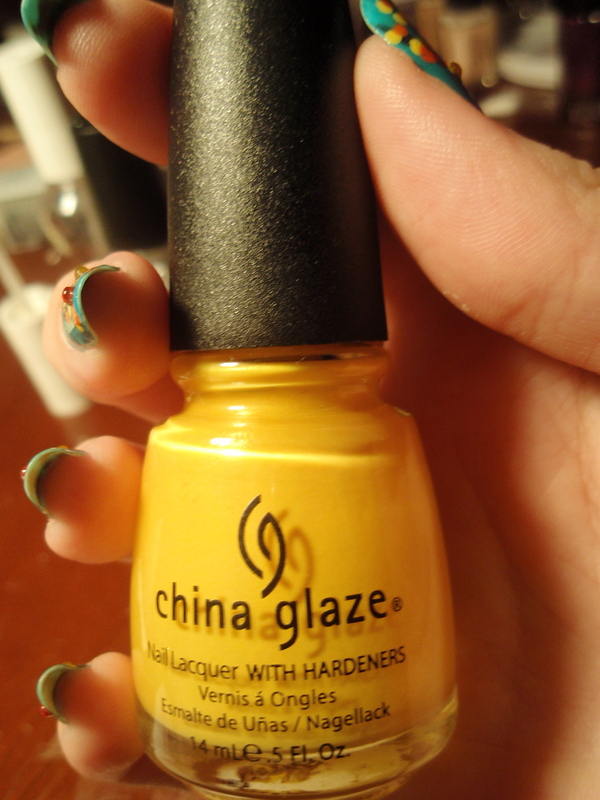 I have gotten my hands on China Glaze’s Solar Power. What happened is that my sister’s birthday is coming up, and I wanted to get her some nail polish, so I went to Sally’s and got her two nail polishes, but I’m not going to say which colors because she might read this. 🙂 It’s a secret for now. Anyway! There’s a long list of colors that I am currently craving for, and the one that I am most in dire need of is Solar Power. So when I was at Sally’s, I knew I could just get one bottle for myself. So I obviously picked Solar Power. And I am SO happy I did. I love this color. I simply love it. 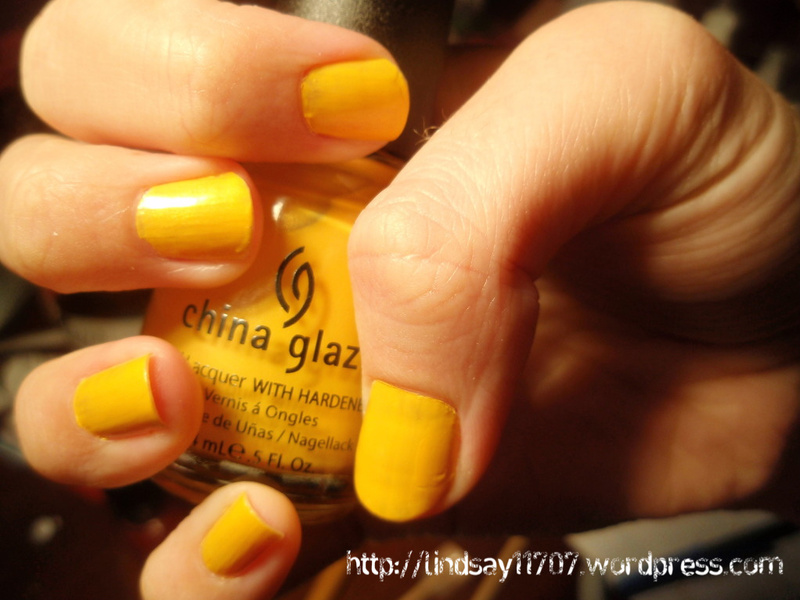 Here’s my review on China Glaze’s Solar Power. This is a photo of the bottom of the bottle and the bottle itself. It’s a super bright, shimmer yellow. 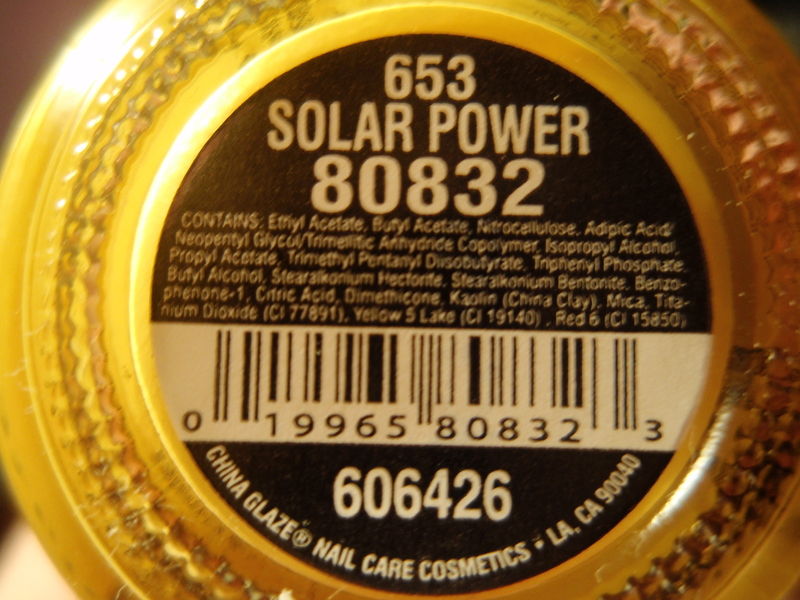 Even though I usually like creme polishes better than shimmer polishes, I love Solar Power. It’s bright, it’s happy, it’s fun, and it’s so SUMMER. It’s really perfect for the sunny season. There’s a REASON why it’s called SOLAR Power. 🙂 It goes on really smooth, and it dries fast. She used two coats, which looks totally fine, but I recommend using three, just to make sure that you can’t see your nail through the polish. I HIGHLY recommend this color to anyone! I think it would look nice on any skin tone. If you’re looking for a bright yellow nail polish that has a shimmer, your search is OVER. Get Solar Power. Just get it. Please. You won’t regret it.